So, in this past week, the Phillies added one of the best pitchers in baseball over the past decade, arguably the top prospect in all of baseball, AND they didn’t lose a game. Not bad, I guess. When you consider that this came on the heels of a week that saw them win just one game and left them 7 games out in the division, it makes it all the more important, surprising, and exciting. General baseball wisdom states that it takes a week to make up a game in a pennant race, and the Phils just made up 4.5 games in a week. I don’t have much to add to the Oswalt deal. I do really like it. The Phils gave up J.A. Happ, a guy that gave them an incredible season last year but it was clear that the Phils front office never had a ton of faith in him. The other prospects are both great athletes with speed, but they’re both 19 and have spent the season in A-ball, and not tearing things up there, either. Plus, the Astros and good old Ed Wade agreed to kick in $11 million of Oswalt’s money, which could be the difference-making financial flexibility that has them adding a nice bullpen piece going into 2011. Yes, the Cliff Lee deal was a disaster. But hats off to Ruben Amaro, as Bry said yesterday, for staying aggressive. Jayson Stark, as usual, has a good piece that details what kind of pitcher Oswalt is right now and delves deep into his numbers on the season. Those numbers are very good, by the way. Jerry Crasnick details how Oswalt will adjust to life in the “big city”. I’m not thrilled with his reticence to come pitch here, but whatever. Bob Brookover argues having Oswalt is better than having Lee. Position Players: You didn’t think we’d actually get through one of these reports without a couple injuries, did you? Nope. Shane Victorino strained an oblique muscle and hit the DL. The Phils have now seen 5 of their 8 everyday players put on the DL this season (not to mention 3 starting pitchers, 5 relievers, the backup C, maybe some I’m forgetting?). Jimmy Rollins also has missed the last three games after fouling a ball off his foot. Moving past the injuries, it was a bounce back week for the offense that they badly needed. Probably a coincidence, but it really got started after hitting coach Milt Thompson was fired after last Thursday’s game, and replaced with former hitting coach Greg Gross. Maybe the real turning point was when they pounded Ubaldo Jimenez, who has been the best pitcher in baseball this year, in a 10-2 win on Saturday. The big individual story of the week was Raul Ibanez. Give credit to Charlie for sitting him against lefties, because it seems like that might have helped him find his stroke again. Raul hit .429 (12-28) with 2 HR over the past week, including a big homer off the lefty Joe Saunders on Thursday. We haven’t seen him hit like this since before last year’s All-Star break. Another guy that had been struggling, Jayson Werth, also had a great week. He hit .407 (11-27) with a homer and five doubles. Placido Polanco, who has started the past six games at second base, and Carlos Ruiz also chipped in with nice weeks. And the bench continued its emergence, as Ross Gload and Ben Francisco combined to hit .421 (8-19) with 2 homers, and Brian Schneider had a big 2-run triple on Monday. It was a nice week defensively, as well. They were a little sloppy on Tuesday, when Ryan Howard had a throwing error (shocking) and Polanco missed a tag. But they made just two errors (both Howard) on the week, and they had some big plays to save the 3-2 win on Thursday. Ibanez made a great throw to nail a runner at second and Wilson Valdez made two incredible turns for double plays. Starting Pitchers: Just a great week from the rotation. Considering the injuries and uncertainty, the starting pitching has been pretty amazing this season. There are some good candidates for Start of the Week, but we’ll go with the effort from Cole Hamels last Thursday: 8 innings, no runs and one hit, even though he took a no-decision. Mr. Halladay had two vintage performances, giving up one run in 17 innings, and striking out 18. If not for a minor mistake by Dom Brown in right on Wednesday, Halladay would have had another shut-out. Kyle Kendrick was sent to AAA last week, but he never pitched there because of the injury to Jamie Moyer. His up-and- down season continued, as he looked great pitching 13.1 innings and allowing just two runs in his two starts. Joe Blanton was solid, giving 6 innings, 2 runs in Monday’s win. Finally, J.A. Happ closed out his Phillie career with a decent outing on Sunday. We wish him well in Houston. With Happ gone and Moyer probably done, the 5th rotation spot is once again Kendrick’s to lose. The starters combined for a 1.82 ERA on the week. Bullpen: The week was an adventure for Brad Lidge, and ‘adventure’ is never a good word for a closer. The trusty save statistic will show that he was 3-for-3 in save opportunities, but it wasn’t that simple. Last Thursday, he came on with a 2-run lead and walked the lead-off batter (always encouraging), then ran a deep count to the next batter before getting three straight outs. That was tame compared to what was coming. With a 1-run lead on Sunday, he loaded the bases with two walks and a single, and squeezed his way out with a strike-out to end it. He took it up another notch on Monday. With a 3-run cushion, he surrendered a two-out, two-run homer to make it 5-4. Then, just in case any fans watching were still breathing, he loaded up the bases by going walk, single, wild pitch, intentional walk, before finally recording the final out on a ground ball. So, it’s no wonder that Charlie didn’t hand him the ball with a one-run lead in the 9th on Thursday. Ryan Madson stayed on to face the first batter, allowing a double. Then J.C. Romero came on and allowed the tying run to score. Lidge looked great in the 10th inning, but who knows what that means. If you look at the numbers, it wasn’t a bad week for the pen. But there was definitely no confidence instilled, either. Lidge just may be the key to this entire season. Here’s hoping he can get the job done. Up Next: Friday night’s series opener in Washington will be must-see for Phils’ fans, as Oswalt makes his debut, and Dom Brown will be back in there in right field. The Phils have three straight series within the division, with a trip to Florida next week before coming back home for the Mets. There is a lot that can be said about Ruben Amaro’s first couple years as a General Manager–and not all good things. But, one thing he most certainly is is aggressive and committed. When he wants something, he acts swiftly, aggressively, and decidedly. And, it looks like he’s done it again today. Overnight, the report came out that the Phillies and Astros had agreed on a deal that would allow the Phillies to acquire Roy Oswalt for JA Happ and a couple of prospects, but it would have to await Oswalt’s approval. And, now, Jayson Stark is reporting that Oswalt is willing to waive his no-trade and join the 2-time defending NL champs. It looks like JA Happ is in on this deal. I think that’s great because I’ve never been nearly as big a fan of him as the rest of the league seems to be. I thought we missed our chance to get max value for him last year, but it looks like Ed Wade still believes he’s got front-end stuff. I never did, and I sure don’t now. I think his absolute ceiling is a serviceable #3, but I think it’s much more likely that he is an injury-prone, hittable #5. I’ll take the under on 40 wins in his Houston career. I don’t think people realize just how good Roy Oswalt is. In his prime, the guy was certifiably one of the best handful of pitchers in all of baseball. Yes, there are concerns about his back, but a lot of reports say that he is as healthy as he has been in several years and he’s still got that deadly stuff. A lot can happen to a guy with good stuff who gains 30 games in the standings overnight. I will concede that the 2010 Phillies, right now, are probably more than just a starting pitcher (any starting pitcher) away from being WS favorites, so if this is their only move, we might still have a disappointing end to 2010. However, this move probably cements the Phils as the overwhelming favorites to win the NL next year and possibly in 2012, also (depending on the specifics of Oswalt’s 2012 salary demands). I just have one last thing to say before we sit back and wait for the details to emerge: When the Phillies traded Cliff Lee, the overwhelmingly prevailing opinion was “Wow, if they had just held on to Cliff Lee and joined him with Halladay and Hamels and this offense, they would be unstoppable for this one year.” Well, now they have brought in a guy on par with Lee (or close enough, at least), and they don’t lose him after this year. There is a decent chance that the Phils now have two bonafied studs at the top of their rotation (plus Cole Hamels, who has gone from a bit overrated to ridiculously underrated in about 16 months) and the best lineup in the National League in place through, at least, the 2012 season. This is a pretty exciting day. Ruben, you’ve been feast or famine so far, but if I had to bet, I would bet “feast” on this one. Oh, and Ed Wade, thanks again, buddy, you’re the best. It’s been an interesting 24 hours for the Phils, as top prospect Domonic Brown was called up yesterday morning, made his major league debut against Arizona last night, and this morning news broke that the Phils and Astros have agreed to a deal that would bring Roy Oswalt to Philadelphia, if he waives his no-trade clause and approves the deal. The lanky Dom Brown crushed a low change-up off the wall in right for an RBI double in his first at-bat, and he later turned on an up-and-in 95 mph fastball and lined a single to right. He also had great poise in the post-game interview, and was clearly thrilled to be in the big leagues. 1. The team is actually good: It’s becoming more and more a memory left in the past, but it wasn’t too long ago that the Phillies were an annual cellar dwellar or, at best, an also-ran. Back-to-back NL pennants and a World Series title have ensured that everything that happens with the team will get more “buzz” and attention than it did from roughly 1985-2007. The only number you need to know to prove this: 90. That’s how many consecutive sellouts there have been at the Bank following Wednesday night’s win. Think back to other hyped debuts for Phillie prospects. Scott Rolen was first called up in 1996 and played for a team that finished in last place in what was really Year One of a dark period between the ’93 Phils era and the emergence of the current squad in the early part of the following decade. I remember well the debut of Brett Myers in July, 2002, but that was a team that regressed from 2001’s breakthrough and finished with a losing record. Chase Utley first played in the bigs in 2003, and though his hitting ability was evident right away, he was still raw defensively and had trouble with lefties. He wasn’t an everyday player until the Phils traded Placido Polanco halfway through the 2005 season. Ryan Howard and Gavin Floyd (a big-time prospect, remember?) were September call-ups in 2004, but the Phils were basically playing out the string for the team that got Larry Bowa fired because they couldn’t get over the hump. The last big debut is the only one that can rival Brown’s, and that was when Cole Hamels took the hill in May, 2006. He was a 1st-round pick with electric stuff, and he fired 5 innings of 1-hit ball in his debut. The Phils challenged for a Wild Card that year, but fell 3 games short. They were the definition of also-rans, but no more. Dom Brown just stepped into a pennant-race, with a team expected to win that race. 2. He’s been tied to numerous trade rumors: In the past, if you were a casual fan of the Phillies, you probably didn’t hear all that much about a prospect until he was on the big league roster, or close to it. Scott Rolen, Jimmy Rollins, and Chase Utley were never discussed much while they were toiling in the minors, even though they were all high draft picks on the fast-track to at least a stellar big-league career, if not more. That started to change as the team started contending with the arrival of Jim Thome and Kevin Millwood in 2003. Suddenly the Phils were semi-contenders, with any and all talent in the farm system libel to be dealt for help at the big-league level. Howard and Floyd were often involved in trade rumors, which raised their profile. Many Phils fans in 2004 were convinced that Floyd should be untouchable because he was a future ace. As the Phils have become legitimate contenders, this has gone to another level. Kyle Drabek and Michael Taylor are well-known names among Phils fans, even though they never played a game for the team. Over the past year, Domonic Brown’s name has been thrown around in numerous trade rumors, usually in relation to Roy Halladay. Phils fans who had never seen him swing the bat (like myself) had plenty of opportunity to throw around opinions on him, and to argue what the Phils should do with him. He’s kind of like an NBA player that played in college rather than one that went straight to the pros from high school. The fans feel like we know him, and we have a bit more ownership over him than we would have if he’d never been mentioned in a trade. 3. He’s the first glimpse of the “future” that we’ve had in a while: Sure, this argument could be made about most Phillie prospects. It’s not too often that a prospect of Brown’s caliber comes along, for any team. A player that you can say, “This guy will be our right fielder for the next ten years”, and not sound like you’re using hyperbole. But two things make this a little different. One, the Phillies have been very stable over the last few years. Yes, they’ve added key players like Halladay, Cliff Lee, Brad Lidge, Raul Ibanez, and Placido Polanco, but there’s a nucleus of guys that have been there together for about five years now. We’ve become very accustomed to this team in a way that hasn’t happened in my lifetime, so it makes the arrival of a guy like Brown, who will lead the way for a whole new Phillies generation in the not-too-distant future, a bigger deal than it could be if circumstances were different. The other reason is tied back to #1. In the past, I’ve referred to a “snowball effect” that can happen to a franchise like the Phillies. They’ve never had an overly wealthy ownership, or at least not one that is willing to lose money to win. But, being in a major sports market, there was always that opportunity to become a high-payroll team that is out there trading for guys like Halladay, Lee, and Oswalt, and able to sign long-term deals for guys like Howard and Utley. They just needed to get a certain level of success on the cheap, with the farm system, and things would start to snowball. Well, that’s exactly what has happened, as the World Series title got the ball rolling at max speed, and 90 sellouts in a row later, the team is awash with the money they need to be an annual contender. So what does that have to do with Dom Brown? Well, he’s not only the first glimpse of the future that we’ve had in a while, he’s the first glimpse of a new future for the franchise. We know that, as long as Brown is productive, he will be a Phillie. Remember, it was just in 2006 that Bobby Abreu was shipped to the Yankees for a bag of used balls. And we can also feel pretty confident that the team will surround him with talent capable of winning more championships. 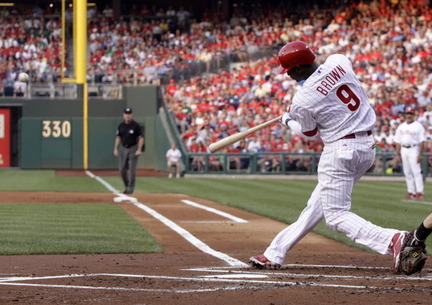 Dom Brown, welcome to the Phillies. Phillie fans, welcome to the new era. It was a long time coming. Prized Phillie prospect Domonic Brown has been called up to the bigs after Shane Victorino was placed on the DL with a strained oblique muscle. He’ll most likely be in the line-up and playing right field, with Jayson Werth in center, tonight against Arizona. This week can safely be considered a disaster. The Phils went into the All-Star break with some good momentum thanks to a 4-game sweep of Cincinnati. It seemed like they were in a good position to put the struggles of the first half behind them and come out ready to make a run at the Braves over the next couple of months. Well, not so much. The offensive struggles, which were evident even in that sweep of the Reds, are ongoing, and this week they added some starting pitching problems to go along with it. They lost 3 of 4 in Wrigley Field, and have dropped the first 3 of their 4-game set in St. Louis. Even their one win was basically handed to them because Carlos Marmol couldn’t throw strikes. There’s been a flurry of roster moves, so let’s recap those. Chad Durbin returned from the DL on Thursday; Nelson Figueroa was waived again to open a spot and he didn’t clear this time, as the Astros claimed him. Placido Polanco was a welcome sight on Saturday, especially when he knocked in the game-winning run in the 9th inning. Juan Castro was released outright to make room. Following a lousy start on Monday, Kyle Kendrick was optioned to AAA, with Andrew Carpenter taking his roster spot briefly, but he’s now been replaced by Vance Worley, whoever that is. Finally, our inevitable weekly injury came on Tuesday, when Jamie Moyer left his start after one inning, with an elbow injury. He’s headed to the DL, and the word is that he could possibly be done for the season. That Moyer injury is a nice segue to the trade rumor section. Ruben Amaro made some unusal statements prior to Tuesday’s game, basically insinuating that a trade for a starting pitcher was imminent. After Moyer was injured, it’s hard to believe that the Phils won’t make a deal for a starter before the deadline, but the quality of that starter is really unknown. The strong rumor that has been swirling the last couple of days has the Phillies obtaining Roy Oswalt in exchange for J.A. Happ and prospects. In a Cliff Lee-esque (but much more understandable) move, the Phils would then send Jayson Werth to Tampa Bay (most likely for young ML talent or close to ML-ready prospects), and put Domonic Brown in right field. It seems that the deal was just about done, but Oswalt has a no-trade clause and has demanded that the Phillies commit to picking up his $16 million option for 2012 before he accepts the trade, which the Phils are unwilling to do, at least for now. As much as I’d hate to see Werth go, I think I’d welcome this trade. If we’re not re-signing Werth after the season anyway, then maybe it’s best to get some young, cheap talent for him, bring Oswalt on board for this year and going forward, and get Dom Brown some experience. We’d still have a good chance to win this year, and would be in a great position heading into next season. Dan Haren and Ben Sheets remain options if the Oswalt deal falls through. Position Players: It must be after the All-Star break, because Ryan Howard is crushing long balls at a high rate. The guy’s like clockwork. Of course, it didn’t do them much good this week, but if it wasn’t for Howard, the team would have really struggled to get runs on the board. Howard hit 5 homers on the week, along with 2 doubles, with a .370 BA and 10 RBI. But the Hit of the Week has to go to Polanco, who came up with a two-out RBI single to tie the game at 1 in the 9th inning on Saturday, which led to three more runs in the inning and the team’s lone win of the week. Placido was solid overall in his first week back. The main culprit of the week was J-Roll, who bounced back and forth between 1st and 3rd in the order, and went 2-24 before being dropped to 6th on Wednesday night. Also, Carlos Ruiz and Wilson Valdez were basically automatic outs at the bottom of the order. Cody Ransom may start pushing Valdez for time at second base, especially after he made a fantastic play in the field Wednesday to start a double play. It also appears that Charlie is starting to institute a straight platoon with Ibanez and Francisco in left field, as Francisco started all three games against left-handers this week. With the offense still trying to get going, the last thing they needed was a 3 game stretch against Chris Carpenter, Jaime Garcia, and Adam Wainwright, but that’s what they’re dealing with right now, with Wainwright taking the hill in the series finale on Thursday. Starting Pitchers: On the positive side, Joe Blanton had two solid outings, allowing 3 earned runs in 7 innings in each , but he came away with just a loss and a no-decision for his efforts. Also, Cole Hamels continued his remergence, holding the Cubs to one run in 7 innings and making that 9th inning comeback possible. Other than that, it wasn’t pretty. Halladay had a rough game, Moyer got lit up on Thursday, and Kendrick was beat up so bad that his next start will be for the Iron Pigs. It will be interesting to see who the starting pitchers are on Saturday and Sunday. Right now, it’s basically anyone’s guess. Bullpen: Oh, the bullpen. Let’s start with the positive: Brad Lidge saved Saturday’s win in his only appearance of the week. The rest was pretty ugly. Jose Contreras continued to regress, getting pounded for 5 runs in 2/3 inning on Thursday. Ryan Madson took the loss on Friday, serving up a solo shot to Aramis Ramirez in the 8th inning of a tie game. J.C. Romero and David Herndon were ineffective on Sunday, putting a somewhat close game well out of reach. And Danys Baez was touched for 3 runs on Tuesday. Charlie must be struggling to figure out the roles in his pen, other than Lidge as his closer. He’s started to use Durbin in more key spots, but I imagine Madson will still be viewed as the main set-up man, unless he stumbles further. On Wednesday night, Charlie let Blanton hit in the 7th inning with the bases loaded and two outs, in a 1-1 game. You could argue that he did that because the Cards had a lefty on the mound and the only right-handed bat on the bench was Valdez, but it certainly doesn’t suggest much confidence in the pen, and can you blame him? Up Next: The road trip comes to a merciful close against the Cards on Thursday afternoon. Then the Phils come home to face Colorado and Arizona. The trade rumors will be the main talk of the week, until something goes down. There’s still over a week until the deadline, so it could be a drawn out process, but Amaro certainly sounds like he wants to make a move ASAP. -The Braves sent Yunel Escobar to Toronto for Alex Gonzalez, in a swap of starting SS’s (there were also some prospects involved, they sound insignificant). I’m not sure this was a good move by Atlanta. Escobar is a promising young player who is having a down year but has definitely been a better hitter than the veteran Gonzalez. I know there’s been some questions about Escobar’s make-up, but this seems like a bit of a panic move to just dump him after half a season of poor production. -The Nets hired Billy King as their new GM. Wow. Major League Baseball is taking a break this week, and when it resumes, much of the talk will be about the trade deadline and who is going where. I feel like we, as baseball fans, spend so much time debating whether or not we should give up our prospects, but then we stop paying attention to them once the deadline passes, and they either remain with the same franchise, or continue their career elsewhere. On the heels of Cliff Lee being dealt for the third time in less than a year, I figured it was a good time to check in on the prospects that the Phillies have either traded away, traded for, or considered trading over the last year. I’ll see this off-the-bat though, the Indians and the Phillies are both looking pretty foolish for dealing Lee for what they did. The Mariners have to have their fingers crossed that they don’t look as incompetent in a few months. -Carlos Carrasco, SP, 23: Carrasco was considered the Phils’ top prospect for a couple years, but his stock was falling throughout 2009. He made 5 starts for the Indians last year and gave up 22 runs in 22.1 ugly innings. He’s spent all of 2010 in AAA, where he has a pedestrian 4.38 ERA on the season. The Indians said recently that they fully expect to have him back in the majors at some point this season, but it’s looking more and more like the best-case scenario for Carrasco is becoming a back-of-the-rotation starter. -Jason Donald, IF, 25: Many Phillie fans envisioned Donald as the 3B of the future, but it was seemingly clear to the experts all along that he would never hit enough to make it as a corner infielder. He started 2010 in AAA but was called up in May. He’s hit .274 with 2 HR in 146 AB’s for Tribe, playing mostly SS and some 2B. He’s been poor defensively at short. He may make it as a starting 2B still, but he looks like he should at least have a decent career as a utility infielder. -Lou Marson, C, 24: Another guy that Phillie fans probably had over-valued. Many were touting Marson as a guy that should take over for Carlos Ruiz. He started 2010 in the majors, but after an abysmal showing (.191, O HR) he was shipped to AAA in June. He’s looking like back-up caliber if he can work his way back to the bigs. -Jason Knapp, SP, 20: This has probably been the biggest disappointment for the Indians, though at 20 years old, he has a lot more time than the other three to put things together. He had shoulder surgery in September and has not pitched since, even though, at the time of the surgery, he was expected to be ready for Spring Training. As opposed to Carrasco, Knapp’s stock was soaring prior to the trade last year, and he remains the best hope to keep this trade from going down as a complete disaster for Cleveland. -Kyle Drabek, SP, 22: After a rough start to his minor-league career, Drabek started really putting things together in 2008, and by ’09 he had emerged as the club’s top prospect. Throughout July ’09, the Blue Jays demanded that Drabek be part of a deal for Halladay but it wasn’t until December that the Phils agreed. Drabek has been very good at AA this season, with a 3.03 ERA, including a no-hitter on July 4th. It’s surprising that he hasn’t been to AAA yet, but I imagine it won’t be long before he makes that move. -Michael Taylor, OF, 24: Taylor was immediately traded to the A’s after the Blue Jays acquired him. He was looking major league-ready in ’09, posting a strong second-half at AAA, but he’s been a disappointment so far for Oakland. He’s been in AAA all season, and has hit just .253, with 4 HR and 9 steals in 269 AB’s. I guess that’s good news for Phillie fans, but he might still become a productive major league OF. -Travis d’Arnaud, C, 21: d’Arnaud was basically a throw-in of the trade, but he’s been solid at High-A for Toronto. He’s hitting .282 with 6 HR in 209 AB’s. -Phillippe Aumont, P, 21: Can you say ‘bust’? Aumont was a 1st Round pick of the Mariners, but was having plenty of struggles. The Mariners moved him to the bullpen in ’09, in the hopes that his raw ability could translate into a future closer. Well, things have gotten even worse, it seems, in 2010. He had a 7.43 ERA in 11 starts at AA before being demoted to High-A. He’s been moved to the ‘pen once again at High-A, to mixed results thus far. -Tyson Gillies, OF, 21: Gillies has been hurt most of the season, but when he’s played he hasn’t really resembled the guy that hit .341 in the minors last year. He’s hit .238 with 2 HR and just 2 steals (he’s supposedly a speed demon) in 105 AB’s at AA. -J.C. Ramirez, SP, 21: Ramirez has definitely been the most promising of the prospects in this trade, but that’s not saying much. He started the year at High-A, but was promoted to AA in June. He’s been solid, but not great, at both stops. -Domonic Brown, OF, 22: Brown keeps making it harder and harder for Amaro to deal him for pitching help. After tearing up AA to the tune of .318, 15 HR, and 12 steals in 236 AB’s, it’s been more of the same since he was promoted to AAA. In 55 AB’s for the Iron Pigs, Brown is hitting .364 with 4 HR. You can rip Amaro for the Lee dump (and by all means, you should), but at least it does look like he made the right choice by dealing Taylor instead of Brown in the Halladay deal. I can’t wait to see this guy play. Because life goes on, and there are other things besides the World Cup going on on “Broad Street,” I’m going to just link the soccer links to this post, so that BSB can continue to operate outside of South Africa.